Hanbiro Review 2019: Is Hanbiro a Good Hosting? Hanbiro is a Korean company that specializes in server management services and enterprise-grade software. Established in 1999, they now have more than 5000 servers globally and serve more than 150,000 clients in Korea, the U.S., Vietnam, China, Japan, and some others. Hanbiro is a Korean company that specializes in server management services and enterprise-grade software. Established in 1999, they now have over 5000 servers globally and serve over 150,000 clients in Korea, the U.S., Vietnam, China, Japan, and more. They operate in several languages, including Korean, English, Vietnamese, Japanese, Chinese (Simplified and Traditional), Spanish, German, Indonesian, Thai, Portuguese, and Russian. 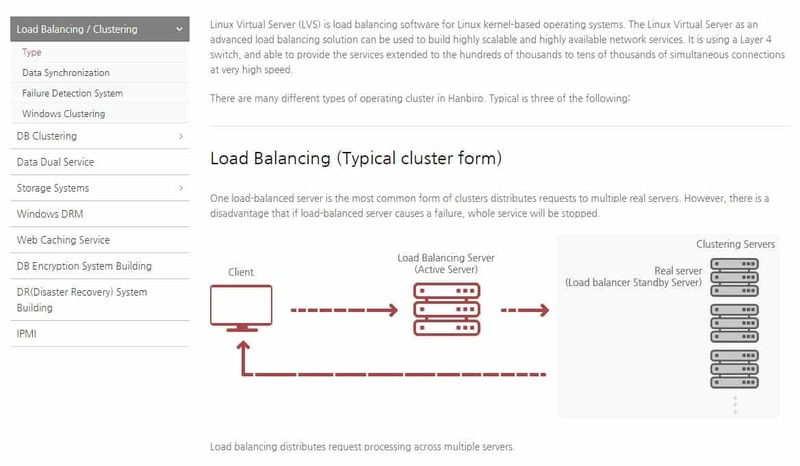 Although their core offerings are their dedicated server management services and enterprise-grade software, Hanbiro’s portfolio is by no means limited. But small and medium enterprises will be happy to know that shared and cloud hosting services are among their many products. Hanbiro recommends their Standard (SOHO type) shared hosting plans for individuals and small to medium enterprises who have a basic and mostly static website. This comes with 1GB storage, 2GB daily bandwidth, and 1 email account. Larger companies that draw more traffic should opt for the Business (Standard) plan, which comes with 3GB storage, 5GB daily bandwidth, and 5 email accounts. If your website is coded primarily in JSP, you could go for the JSP plan, which comes with 5GB storage, 5GB daily bandwidth, and 5 email accounts. Hanbiro also offers a reseller hosting plan. Businesses that require even more bandwidth and performance should go for their cloud hosting or managed dedicated server offerings. Given that they specialize in server management, Hanbiro’s servers operate effectively and efficiently. All of their hosting plans run on load balancing and database clustering technology, along with complete disaster recovery solutions. This means that your websites and databases load faster even during peak traffic hours, and you needn’t worry about ever losing your data in the event of any mishaps. Hanbiro’s Linux and Windows shared hosting plans are priced the same. For what you’re getting, these rates are relatively affordable, though not the cheapest in the market given that there’s no free domain registration included. The plans tend to be heavy on the bandwidth, which is good news for the Asian market. Hanbiro does not offer a free hosting plan, but they do give free months of service if you sign up for a minimum term length. Paying for six months of service in advance affords you one free month and paying for one year in advance affords you two free months. This policy does not apply to their Standard (SOHO) plan – only their Business (Standard) and JSP plans. Hanbiro’s primary support channels are live chat and email. They have a telephone and fax number listed, but this seems to be primarily for their Korean customers – when I called the number, all the instructions were given in Korean. This may prove problematic for international customers. Although they also have offices in Japan, Vietnam, and the United States, these seem to be operational and development centers rather than for customer support. Hanbiro’s years of experience in the server management industry gives them the expertise and track record to back up the level of service they’re offering. While their shared and cloud hosting plans aren’t the most affordable, they do offer excellent reliability and performance for their largely Asian customer demographic. Wondering how Hanbiro stacks up against other Web Hosting companies? Enter any other Web Hosting company and we will give you a side-by-side comparison.